It’s a common assumption that lightning is the sole culprit for tracks, marks, or other large visible chimney damage, especially in areas that are prone to or have recently experienced a thunderstorm. But insurance companies should take note that these telltale signs of a lightning strike could be caused by other means. However, none of these symptoms result from lightning alone. Spalling, also known as “freeze/thaw,” accelerates the deterioration of masonry materials by allowing moisture to seep into the brick and mortar. When temperatures plummet, the water inside freezes, which can cause the mortar to crumble. Another serious chimney issue, shaling occurs when the flue liner is damaged and could result in a fire. Shaling damage can easily be detected by professional chimney inspectors who have the right equipment. Each time the fireplace is used, thin ribbons of soot condense and adhere to the chimney walls. That is, not all the by-products of the fire are expelled through the top of the chimney. This buildup is called creosote, and is highly combustible. Too much creosote in the chimney could result in a fire. The chimney crown protects the chimney from outdoor elements. If the crown is cracked or damaged, it can allow water and other debris to enter the chimney. Cracked crowns can often result in spalling or shaling. There’s always a chance that the insured’s chimney simply isn’t constructed well. The builders may have opted for cheaper materials, or it may be a case of faulty construction. If your insured is claiming lightning damage to their chimney, they might be right. However, it’s up to you to find out for sure. First, inspect the roof and ground for bits of chimney brick or stone. If a lightning strike did damage the chimney, the strike could have scattered remnants from the destruction along the outside of the house. You should also inspect the crown for cracking and other signs of wear. A crack in the crown may allow water to leak in between the crown and lining, which can cause spalling and shaling. 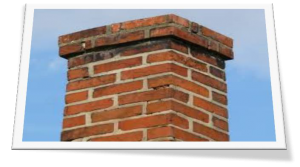 Find out the date of the insured’s last chimney inspection. You may be able to contact the company who performed the inspection to see if you can glean any helpful information from their report. If you still can’t determine whether the damage was caused by lightning or another factor, you can partner with a chimney inspection service that specializes in detecting chimney damage. Many companies have special equipment, such as cameras, that can perform a more in-depth inspection to help determine root cause. Keep in mind it’s your responsibility to ensure you reach a conclusion that’s fair to both the insured and your company. While you want to do everything in your power to assist the insured, they’ll appreciate the extra time you take in ensuring you give them in providing an accurate resolution.